The world needs great individual educational changemakers capable of identifying problems and creating bold, scalable solutions. 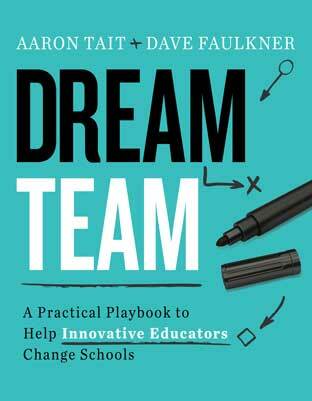 But the world also needs Dream Teams—groups of talented administrators, teachers, staff, students, and community members who are passionate about making things better for kids, believe that school-based change is the means to this end, and are willing to roll up their sleeves and work together to achieve it. Innovative educators come in all forms, and they require lots of options. Here, you'll find a collection of practical ideas and tools designed to fuel transformational leadership without sacrificing instructional excellence or anyone's sanity. Whether your team is a group of fearless rebels, more cautious types, or somewhere in between, Tait and Faulkner's flexible approach can help you figure out where you want your school to go, build a more collaborative and creative culture, and generate the solutions that best serve your students. Aaron Tait is a cofounder of Education Changemakers and its director of innovation. A global leader in innovation for impact, he is at the forefront of a movement of "entrepreneurs changing lives." Dave Faulkner is a cofounder of Education Changemakers and its CEO. Faulkner has emerged as a global leader in education innovation.